Choose from a library of industry-recognised surveys created by experts. Each survey is focused on demonstrating impact along specific outcomes. Enter survey results directly into your hub or send your beneficiaries a link to complete the survey themselves. View each beneficiary’s survey response and collect multiple responses to the same survey over time so that you can see the difference your programme has made to them. 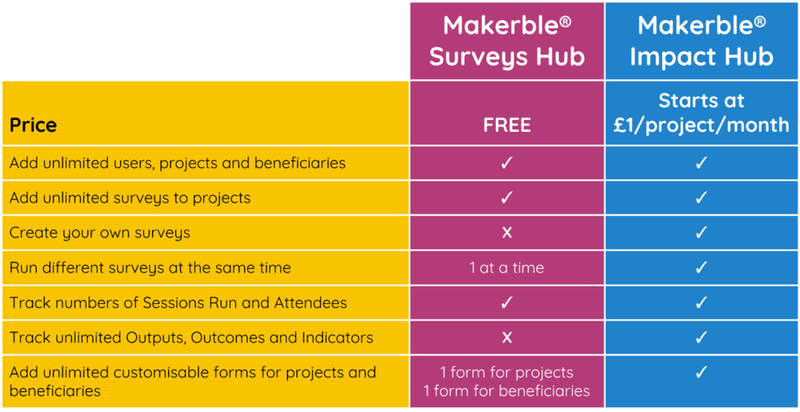 If you are an organisation that needs to use more than 1 survey at a time, track additional metrics beyond “Sessions Run” and “Attendees” or create your own Surveys, upgrade to Makerble’s Impact Hub with pricing that starts at just £1/month. More details are shown on our pricing page.